The reduction in daily energy expenditure is strongly correlated with the abrupt increase in the number of obese individuals . 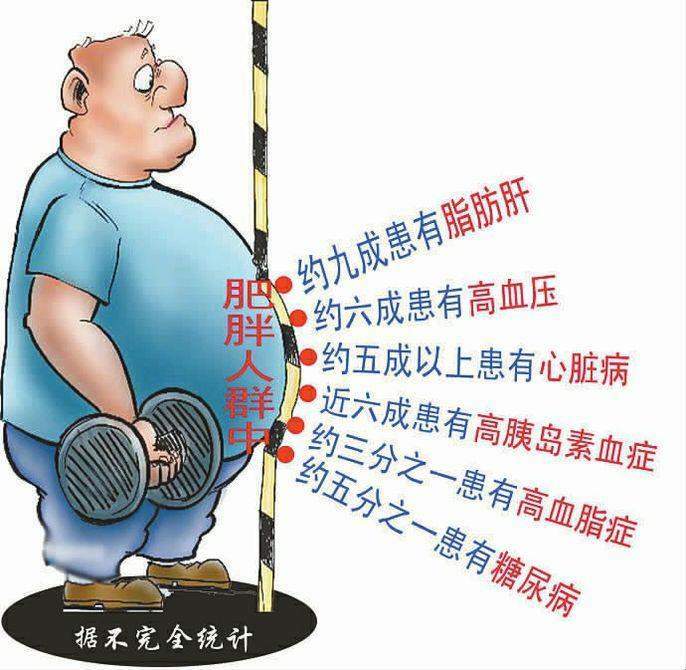 Physical exercise is an important tool for controlling body weight . In this study, animals in groups A and S exhibited reductions in the body weight AUC values compared to group C. During physical exercise, the skeletal muscle might increase its energy expenditure up to 100 times during physical exercise . Minimum lactate (ML) intensity corresponds to approximately 77% of the maximum oxygen consumption (VO2; VO2max, for maximum value). In our study, animals in groups A and AS were subjected to training at 80% ML intensity, corresponding to approximately60% of VO2max . The energy expenditure during long duration exercise performed at moderate intensity is obtained mostly by lipid mobilization, followed by carbohydrates and finally by proteins. Triglyceride mobilization might explain the weight loss of endurance-trained animals at the end of the study. Animals from group S might have responded to the increase in energy expenditure and muscular hypertrophy caused by this type of high-intensity training . Insulin sensitivity and glucose tolerance are significant tests to determine the efficiency of carbohydrate metabolism. In the strength training exercises used in this study (group S), lactic glycolytic energy predominates. In this system, glucose captured by cells is degraded into two acetyl-CoA molecules that are transformed into lactate, supplying two ATP molecules . This reaction is a powerful activator of carbohydrate metabolism and glucose capture by glucose transporters-4 (Glut-4). 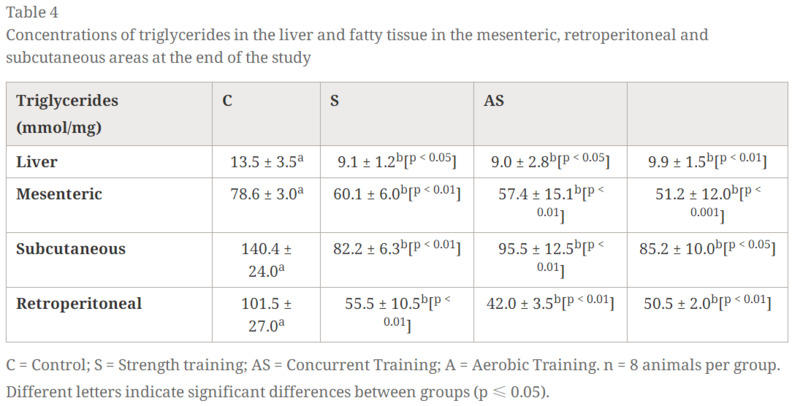 According to the results described in Table 2, there were no significant differences between the exercised groups and control in this regard. However, the glucose tolerance and insulin sensitivity values found in the exercised groups approach the values found in other studies [11, 29]. Moreover, no differences were seen in the blood glucose levels of animals at the end of the study, suggesting that no alteration of carbohydrate metabolism occurred. The lipid metabolism levels of animals were altered. There were increases in blood HDL cholesterol in groups A and S compared to the control group. Moreover, exercised animals exhibited reductions in the concentrations of triglycerides in the liver and fatty tissue in all investigated areas compared to the control. An increase in energy expenditure might explain the reductions in the concentrations of these lipids. During exercise lasting 1 to 2 h, intramuscular triglycerides are consumed, and the lipolysis mechanism is activated in the fatty tissue that supplies carbon skeletons for physical exercise. Alternatively, triglycerides might be re-esterified and stored in the muscle tissue for future use . During strength exercise, there might be an increase in energy expenditure and basal metabolism due to the muscular hypertrophy  developed by this type of training . The reduction of liver lipids in group A might be related to an improvement in liver function and the subsequent increase in HDL cholesterol production. Several studies suggest an improvement in the lipid profiles in endurance-trained rats [31, 32, 33, 34]. The reductions of triglycerides were significant in all fatty tissue areas investigated in the trained animals. An increase in energy expenditure caused by physical training and possible metabolic alterations might be the major cause behind the improvements in the lipid profiles of rats. Similar to previous studies involving different exercise protocols [35, 36, 37], this finding shows that at different intensities, volume and energy predominance, physical exercise is an important tool in the fight against obesity. Another beneficial effect of physical training that was observed is related to the concentrations of TBARS lipid peroxidation markers in the blood of exercised animals (groups A, AS and S). This finding is interesting because an increase in lipid oxidation is also seen in obesity. However, in this condition, lipid peroxidation is caused by the increased production of free radicals [38, 39]. In the long run, this imbalance in reactive oxygen species might make the antioxidant system unable to reduce free radicals, causing its failure, decreasing its activity and blocking its protective role . 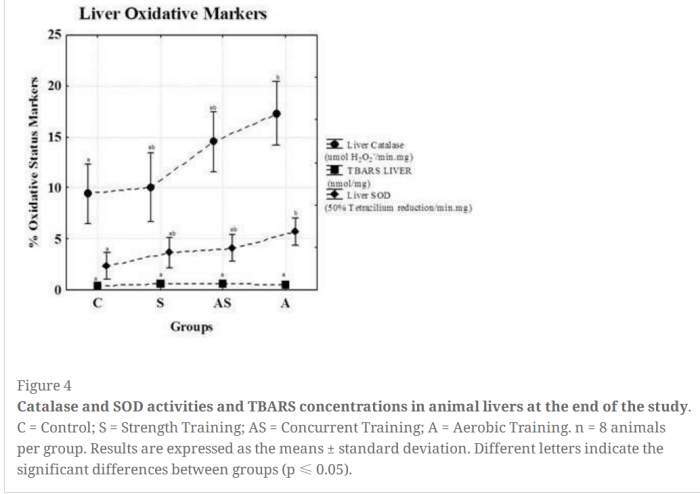 Physical exercise might have improved the efficiency of lipid oxidation and the antioxidant status, which was diagnosed by means of superoxide dismutase activity in animal livers in groups A, AS and S and catalase activity in the animal livers in group A. These enzymatic antioxidants are present in all mammalian cells and are associated with the reduction of O-and H2O2- in the respiratory chain . Maintenance of the antioxidant mechanism and a decrease in the structural damage caused by reactive oxygen species are very important for obese individuals. A steady high-level reactive oxygen species state could lead to cell structural damage, which, in turn, increases the concentrations of inflammatory markers such as TNF-α, interleukin 6 and interferon-γ and decreases the concentrations of adiponectin and anti-inflammatory interleukins [42, 43]. Maintenance of inflammation leads to the damaging effects present in metabolic syndrome, such as endothelial dysfunction and insulin resistance . Peroxidation of blood LDL cholesterol allows atheromatous plaques to accumulate on the endothelial walls, which might eventually detach and block blood flow in important small-caliber blood vessels, causing cerebrovascular accidents, myocardial ischemia and infarction . Inflammatory markers decrease insulin sensitivity by causing dysfunction of insulin receptor substrate-1 (IRS-1) and insulin receptor substrate-2 (IRS-2), decreasing glucose capture and consequently increasing the dependence on lipid metabolism, thus creating a vicious circle . Physical exercise might interrupt the full chain of events and make this unhealthy status regress . Physical exercise might also increase the efficiency of lipid oxidation and the activity of anti-oxidizing enzymes. 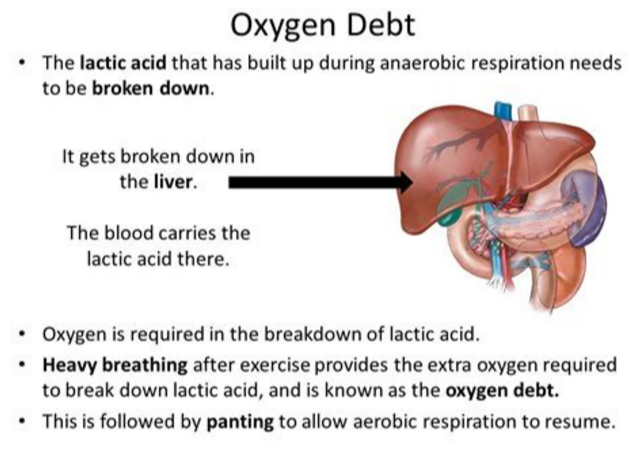 In conclusion, physical exercise was efficient with respect to the following: reducing the storage of triglycerides in animal livers and fatty tissue; decreasing the body weights of animals in groups A and S; decreasing the lipid profiles of animals in group A; significantly increasing the activities of the anti-oxidizing system; and reducing the concentrations of lipid peroxidation markers. Further studies are needed to identify other physical activity intensity zones that can achieve improvement in these markers.